At long last, many might say, the football season is drawing to a close. For many of us it finished in January when Pools really had nothing to play for except their pride. A far cry from the sunshine in August when our hopes and expectations were high and now are broken and shattered throughout the country at places like Fylde, Bromley, Harrogate, Dover and on many occasions in Hartlepool itself. Along the way we had many cringe-worthy moments. Easy in hindsight to say that the appointment of Matthew Bates proved to be a huge disappointment but based on his previous track record there was little argument that he was the man for the job. Some of his signings looked to have pedigree but Andrew Davies and Luke Williams, like Bates himself, proved to be injury prone. Players with a history of injuries, who are possibly looking for one last pay day, should in my view only be signed on a small retainer and then on a pay-as-you-play basis ...or pay-through-the-pain basis. "Hignett cannot afford to rest on his laurels, as Bates seemed to do, and must realise that Pools are still a long way from being the finished article and promotion contenders." Then of course we had the Money problem, thankfully not the money problem that we had last year but one, none the less, which left our team broke of footballing ideas. Looking back, I still cannot understand why he decided to apply for the manager's job in the first place, and a couple of weeks later felt that he should swap roles with Craig Hignett as director of football which at one stage Pools seemed ready to accommodate. Thankfully he left the club and was being hailed as a man of principle when he did not seek any of the compensation to which he was apparently entitled for leaving the club. Who sanctioned that contract? I fail to comprehend how Pools would have had to pay compensation when he wasn't happy in the job he applied for in the first place. It would have been interesting to have seen that case go to a job tribunal. "M'lord I was unfairly dismissed from someone else's role." Still, out of every bad situation some good can be found as was the case with Pools: Craig Hignett was appointed manager resulting in the team's fortunes and style of football improving dramatically. Another result was that Raj made the role of director of football (man upstairs) redundant, thus another wage saved. Hignett cannot afford to rest on his laurels, as Bates seemed to do, and must realise that Pools are still a long way from being the finished article and promotion contenders. At the time of writing Pools are 25 points off the top place and 15 points from the last playoff spot which is not good enough even with the squad of players that we have. On a positive note by bringing in players like Holohan, Edgar, Kerr, Bale, Kabamba, Amos and Molyneux, Hignett can treat the remaining fixtures as a pre-season and if necessary drop some first team regulars to keep them on their toes and to run the rule over many of the loan signings we currently have on our books to see if they are fit for purpose. The club, via the commercial department, needs to get closer to the fans again and vice versa. Compared to HUST, the club is doing very little in the way of sportsmans' dinners, golf days or a meet-the-manager /Raj evenings. I think that the club see HUST as competition but HUFC should do their own thing or possibly work in conjunction with HUST. They should also be looking at offering special deals on the corporate boxes as for most of the season the majority of them have remained empty. I am not suggesting that they run things at a loss but as my old boss used to say "1 per cent of something is still a lot better than 100 per cent of nothing." It is probably too late to organise but the commercial department should have taken a leaf out of Darlington 1883's book and selecteded several football strips being considered for the first team next season and let the fans choose their favourite via an online vote. Then it could have been launched at an open day similar to the one which was held last summer. It is said that HUFC is considering moving the club shop to the front of Pools' offices which I think is an excellent idea but they really do need to look at extending their stock/range offer. Hopefully with Raj's backing and Hignett's promising managerial skills (and so far, not playing Borer-style football) we are going in the right direction. Let us not forget that this time last year we nearly did not have a football club to moan about! It is getting boring and predictable as we beat the high-fliers one week and lose to the pub team in the following game. Losing to Eastleigh through three set pieces is ridiculous and mainly due to one person on the pitch and two off it. The big wobbling pink blancmange who appears to be glued to his line and afraid to come out for crosses is the main reason we lost and surely the time is up for him as Number One. The defence in front of him have no confidence in him and don't know what the hell he is going to do next. 6ft 4in tall with the heart of a dormouse. Get the young kid between the sticks for the remainder of the games and see if he is worth keeping for next season. Of course the main culprits for the defeat are the coaches who picked the team. Messrs Hignett and McNamee in their infinite wisdom decide Xavi is a better bet in midfield than Hawkes or Holohan. Eh? Hawkes in a fertile patch of scoring left out in favour of a guy who has been a perennial loser in the five years he has been here. And couldn't hit a cow's arse with a banjo. You really couldn't make it up. "The present squad needs cutting right back to a handful of players and some fresh blood being brought in who can play in this division"
Now Gary Coxall, who is universally accepted to know sweet Fanny Adams about football, twigged on that Hignett was not a football manager and gave him the heave-ho. After which there was not a queue of clubs lining up to take on our man as manager. But then something that has happened far too much over the years, the jobs-for-the-boys syndrome kicked in. Friends with the owner, he gets back in as director of football, a role created for him and which Pools certainly don't need as I have said from day one. And when they gave Bates, another Borer boy, enough rope he duly hanged himself. So Craig suddenly decides he wants to be a manager again with his mate and boss keen to give him another go. Well there is no noticeable improvement in our league position and the defence looks ready to concede every time the opposition attack. Any criticism, constructive or otherwise is answered by what some of the fans know you could get on the back of a postage stamp. Most fans could tell him that Josh Hawkes is a better footballer than the little fat feller. Hignett is quoted in the local paper saying that he needs three or four players in the summer to get his squad up to scratch. If that is all the players he brings in we are for a long and miserable time in the National League. The present squad needs cutting right back to a handful of players and some fresh blood being brought in who can play in this division. Some tall, hard men who can get about the pitch and show a bit of desire unlike the present time wasters. Michael Raynes looked ideal for this division until he got injured and I would like to see him brought back on a permanent basis. Of course we have the unknown factor in Luke Williams who could get a couple of games in before the end of the season. He could be either troubled by injuries for the rest of his career or turn out to be our best midfielder since Jan Ove Pedersen. Let's hope it is the latter as he would be some player and eventually we might get a massive fee for him. Not like we got for teenager Luca Murphy, who left the club and then signed for Premiership Fulham. This was a move that nearly went through in January until the London club pulled out. I am not saying Fulham would do such a thing, but we have seen clubs in the past taking away young players for next to nothing. We have been done over too many times in the last five years for another bunch of shitehawks to come along and try it on. There were some who were saying that March was a boring month. No relegation dog fight and no financial worries to tax the mind. Just mid-table mediocrity. Yet, Pools served up some good performances at home but slipped up on the road. What about the Dover Athletic game? 2-0 down up to the 70th minute and there was a realisation that Pools were going down to yet another home defeat. But what happened then? Two penalties in three minutes and the winner in added time all made for a change of atmosphere. 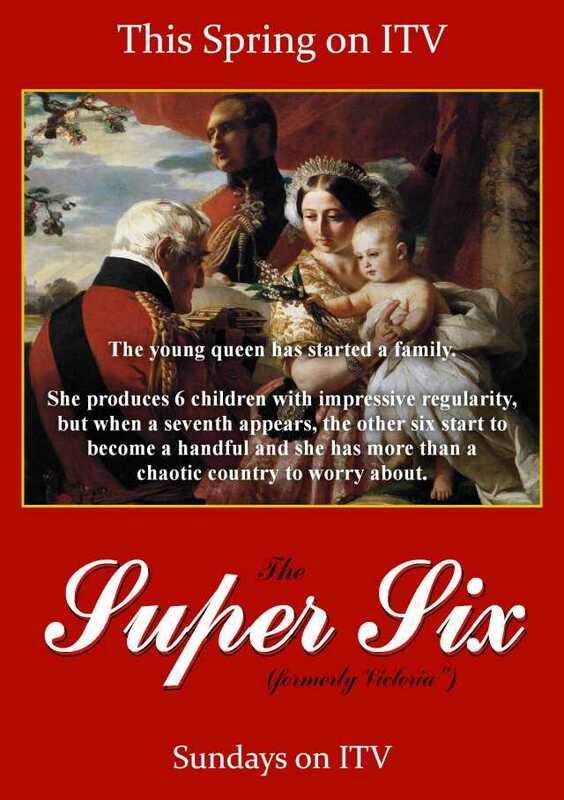 As one guy said at the number 6 bus stop “Sixty eight minutes of pure crap and twenty two minutes of pure magic.” Come to think of it, if the forebodings about Brexit are correct and we have long tail backs of traffic into Dover then we might not be able to get there to play them next season. Given the drubbing that was inflicted on us by Barnet in the televised home game, getting the goalless draw down there was another creditable performance. Overall, we have to be delighted at the form of Luke James – ok, he’s not scoring the goals but his work rate has been invaluable. By the way, did you know there was such a thing as an England C side? We’re certainly tucking the penalties away this season. Even when the goalie got a hand to the ball against Wrexham, Josh Hawkes’ effort still crept over the line. But it wasn’t always so. At the start of the 2006/7 season, we had the opener against Swindon Town – and were awarded two penalties which were both saved by a Slovakian keeper who couldn’t speak English. (Only Denis Wise would come up with something like that!) The same month saw us appearing at the National Hockey Stadium against Dons. The result was a 0-0 draw but guess what – we missed a penalty. "Overall, we have to be delighted at the form of Luke James"
A good April is in the offing. Home games against Solihull Moors, Halifax and Salford means we are playing two teams who are up for the play offs. How we perform against them will give Craig Hignett some idea of how his squad will shape up next season. And then the final away game against Barrow isn’t too far away for the fancy dress parade. There is certainly a lot more confidence in the air and we can only hope that things work out well next season. 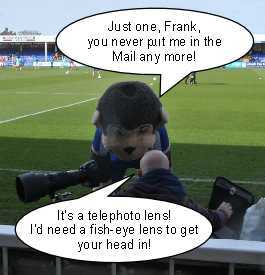 The sale of season tickets should give us some idea of how Poolies see things. Finally, something not entirely relevant to footie. On the afternoon of Friday, 29th March, wifey and me went to see a song and dance show at Billingham Forum Theatre – Remembering the Movies. The dancing was out of this world and so much effort was put into it. It was exhausting just watching it and at the end of the show, I remarked to wifey that when highly paid bog standard Premier League players complain about being tired playing three games a week then they should be made to watch the show. Not only did they have to do one two-hour show in one day but two. It brought things into perspective. JANE AUSTEN'S ALLEGRO on the strange case of Luca Murphy. I don't know much about the lad and only saw him play once when Pools were beaten by Shildon in the Durham Challenge Cup. He could have done better for Shildon's second goal but overall he had a reasonable game and looked good going forward. Although I am unable to recall the player's name, my mate and I both agreed that the lad who played alongside him looked a better player on the night. It was said that a number of Premiership clubs had been keeping tabs on the lad and it came as no surprise that Fulham came calling and took him on a two week trial. "I would like to wish the lad well but based on what I have read, I am unable to do so." According to Pools, after the trial, Fulham said that he was not good enough for them and gave HUFC a list of reasons to support their decision. Reports stated that upon his return to Pools, Murphy would not sign a professional contract and that he threw his dummy and reputation out of his pram, and overnight had become an all-round bad egg to the extent that his attitude was having a detrimental effect on the youth dressing room. Reading between the lines I would say that he may have been advised to play the spoilt brat and create a situation with which to force the club's hand. That being the case, Pools rightly, but bravely, decided to let him go. Next thing we know, Fulham have signed the lad on a two and a half year contract. Not bad for someone they did not rate a few days earlier. I wonder if they will advise Pools the reason for this change of heart. It makes me query the quality of the Cottagers' coaching staff. Assuming they do have a case, Mark McGuire and Raj Singh must rigorously pursue every available avenue with Fulham to seek some sort of financial redress or to have the player banned from playing for them until the situation is fully investigated and resolved. Hopefully Pools still have written evidence from Fulham giving their reasons for not wanting to sign Murphy in the first place. It is sad really, as Fulham are one of these clubs that most people like but if it is they who encouraged this move they should hang their heads in shame and be made to pay a decent fee for the player as well as having appropriate action taken against them and anyone else who was involved in such underhand chicanery. 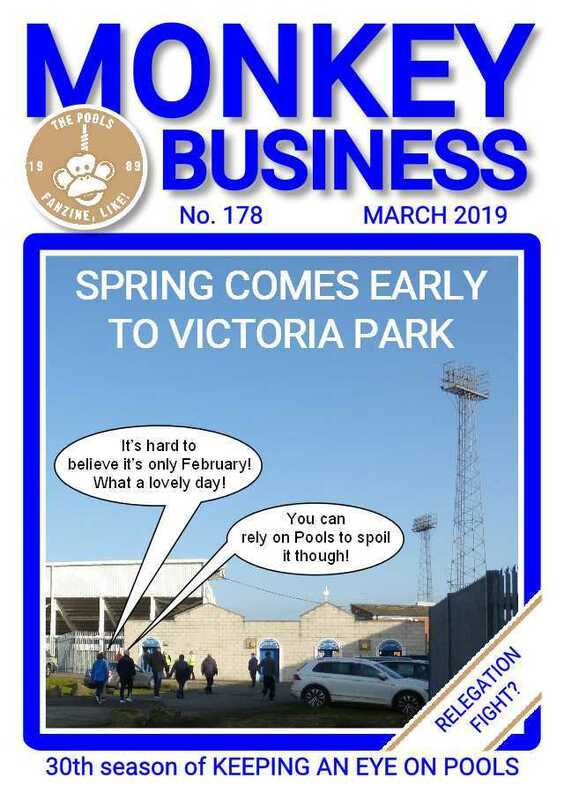 Sadly I fear that Pools' efforts might come to nought for I have no doubt that the Premiership will look after its own even though Fulham are soon to leave the Greed-is-Good league ...or have they just joined it on a lower level? I would like to wish the lad well but based on what I have read, I am unable to do so. Perhaps he would have been better guided if he had spoken with Luke James on his experience of leaving Pools at such a young age in yet another badly-handled move. So far as I can see there are only two winners in this sordid affair. The player himself who will no doubt get a hefty signing on fee and his agent, who will doubtlessly take a handsome percentage from this same signing on fee. I do hope that they enjoy their filthy lucre. Much to the consternation of our heirs, my carer and myself decided to dip into some of their inheritance and have a winter's break in Madeira. As you disembark from the aircraft the first thing you can't help but notice emblazoned on the side of the terminal building is not its name Funchal, but a very large image of one Cristiano Ronaldo. This was a marker for the whole holiday as his presence is felt all over the island. 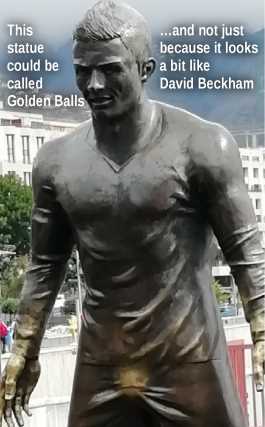 Previously I was not aware that Ronaldo was born and bred in Madeira, nor was I aware that Christopher Columbus spent many years here as well. Have the two any connections? Well perhaps, one could argue that Columbus literally stumbled and fell upon America and Ronaldo stumbled into many a penalty box ...and just fell. On our first day in the capital Funchal, we intended to perambulate along the magnificent sun-drenched esplanade but as one of the wheels was buckled, we decided to have a walk instead. The place is spotless with no litter or chuddy stuck to the pavements and, best of all, no rarfs. The marina was dotted with yachts and cruise liners aplenty and I swear that if it wasn't for the warm wind, were you to close your eyes ...tightly, very tightly, you would actually believe that you were on the promenade near the bandstand on the Headland. As we approached the end of our walk the bride pointed and said, 'Look over there - it's the CR7'. My camera was instantly at the ready and scanning the road to see if I could spot the latest offering from Jaguar ...or Citroen, but no luck. Instead I was then reluctantly and gently ushered into the CR7 - the museum, or should I say holy shrine, in honour of Our Lord Cristiano Ronaldo. Looking at the numerous trophies, caps, cups, medals and awards that are on display which he has won over the years, you have got to admit, like him as an individual or not, that the boy has a talent. It is little wonder that his family have created this museum as a money-making place of worship ...or perhaps his mam just had a quiet word in his shell-like, saying that there was not enough room on the mantelpiece for all that silverware in her semi back home. "He's good, but he is no Ritchie Humphreys"
I could not begin to imagine how much the family spend on Brasso and Dura-glit to keep all those trophies gleaming. 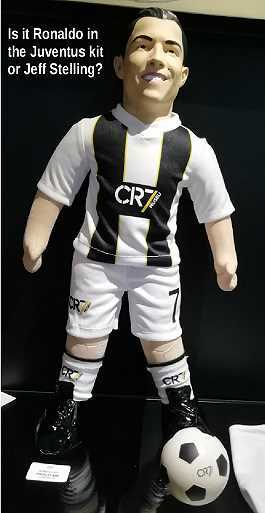 They also had a very clever interactive screen which fans could stand in front of, and Ronaldo would appear stage left, ball juggling, then stand beside the fans who would then have a photo or video taken beside him. After a few seconds he would turn around give a big smile and wave at them, leaving them, and their parents' pockets, a few euros lighter. I was going to suggest another interactive amusement. As the museum is located directly beside a quayside with crystal clear water, how's about a diving board? The seafront aside, pretty much every other bit of Madeira is on a hill, a slope, a dry bobsleigh run, an incline, a bank, a side of a mountain, a gradient or a ramp. Obviously there is a downside to all these. So playing 'at this level' could only enhance his ball control, dribbling skills, his balance as well as his fitness levels and to my mind it is the terrain of the island which has made him the player that we know today. 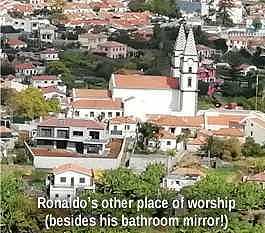 On one of the organised tours we went on, the guide not only enthused about the mountain vistas, the stunning coastline, the desalination plant of St Santos and the overall beauty of Madeira, but at every given opportunity along the journey Ronaldo's name cropped up, whether it be the site of his old house, the football ground he played at or the church which he attended, all of which were pointed out to us with glowing pride. The guide also described the recently-installed domed radar station on the other side of the island similar in style to the old golf balls on Fylingdales Moor. I suggested to him that when Cristiano finally pops his boots and dives head first through the pearly gates, the Pope should commission a massive statue of him on top of this radar dome much like the one of Christ the Redeemer that overlooks Rio de Janeiro. At first he looked shocked by my proposal, but then agreed that it was a capital idea. He also told us that Ronaldo insisted that he would buy a car for his mother, this despite the fact that she could not drive. She was expecting a little Fiat 500 or a Berlingo to go on the drive but instead she ended up with a top-of-the-range white Ferrari. He told us to avoid the city centre about half-eight each morning as she drives down to open the museum, because there is always queue of traffic behind her as she never exceeds 20 mph. As for parking tickets, the police send them direct to Cristiano. He also said that sadly, Ronaldo only gets to visit home a couple of times a year; his visits are all hush hush but once the news is out it is bedlam and he gets mobbed everywhere he goes. Remarkably, with a population of just over a quarter of a million people, up until recently when Uniao De Madeira were relegated, Madeira had three teams in the Portuguese Premeira Liga. The remaining two sides Nacional De Madeira and CS Maritimo have to play 16 of their away fixtures on the Portuguese mainland. Capital to capital that is a 1,200 miles return trip. And Pools think they clock some miles up during a season. Madeira tourist board product placement: Over the years I have visited three of the Canary isles and let's throw in Cyprus for good measure but Madeira (if we ignore its German tourists, who do not comprehend the meaning of the word 'queue'), is in a different league altogether. Very genteel. To those people who fall into the Brits-on-the-P--s category or who get a kick out of being a general nuisance to one an all and are normally decked out in union jack shorts and football tops, thankfully this place is not for you. Another visit from a potential promotion side looked ominous today, especially when I saw the size of the defenders. Pools were on a hiding to nothing as for the first time in our history we had had three players away on international duty all at the same time. Luke James was the only one of the three named on the bench and he did get fifteen minutes at the end as Noble was running a bit hot and had already been booked; James came on and as usual rattled the cages of a few of the visiting defenders. The atmosphere in the Vic was bouncing after a ticket offer was made by the club and the noise made by the fans sounded a lot more that the 3888 that was listed on the club website. It was good to be part of the whole event as it was a bit like an old-style blood and thunder Darlo-Pools derby of the past, only this time both teams played some decent football! Ex-Poolie Brad Walker, who was on loan to the visitors, was absent and Clever Dicks only made the bench. One touch of nostalgia was that Son of Andy Dibble was listed as playing in goal for Wrexham, but this was switched to Laiton. Overall Laiton looked a bit stressed by it all, showing some over-the-top exaggerated signs of anger towards his defenders for allowing Pools players to attack his space. Attack we did too, the game was end-to-end throughout, and both teams were defending well and just missing out on clear goal chances. The game set off at a rattling pace and Wrexham looked dangerous, especially the winger who Anderson had a job with as he was a real handful, but Anderson had probably one of his best games ever. As did Kerr; he looks like one cool cat on the ball - never looks ruffled and plays the game simple; either of these could have been contender for Man-of-the-Match. "there were some naughty tackles on Molyneux especially, who was torturing them down the Cyril Knowles side"
Pools were awarded their third penalty in two home games as Hawkes, on a zig-zag run into the box, was chopped down. Hawkes stepped up to take the kick and from the opposite end of the ground it looked and sounded like the keeper had stopped it but the huge cheers signalled a goal for Pools. The visitors tried to step it up, looking for an equaliser but they became a bit desperate and their game looked a bit raggy as Pools pushed them back and ran and were well organised at the back and retained the lead comfortably until half time. Early in the second half the visitors put a bit of pressure on us as they kicked towards their own fans in the Rink End. Kabamba had a right battle on his hands but he never gave up, not winning a lot in the air but on the deck he has some nice touches and seems to be able to flick a ball at will in any direction. Pools had to establish themselves again in the second half under a lot of pressure from Wrexham and there were some naughty tackles on Molyneux especially, who was torturing them down the Cyril Knowles side. The visitors stupidly reverted to the long ball down the middle all the time but Pools defence held them with some heroic displays, especially from Kerr and Anderson. Pools controlled the game and played some very good attacking football to take a very valuable three points from one of the favourites. All fans like to have a prediction on the game and my only option for any game home or away is a three one win for Pools. Which it was not today as I went for three nil to Pools and after a comment about them being a bogey team I thought I would look up the record. And it is miserable reading with three defeats before today's game. With the new boys Kerr and Edgar in the starting line up it is just as well that we are not restricted from bringing in players and with absentees Magnay and Kioso not yet ready to play we needed a lift. Pools set off the game at a good pace and a shocking tackle sent Kitching head over heels in the first three minutes, the defender letting him know what was in store. The defender took a booking but it could have and should have been a red. Pools looked like they were really up for it as they took the game to the visitors and had most of the possession early on and threatened the goal but the visitors defended well and Pools struggled to get clean balls in the right area. With a strong wind in their faces Pools battled hard but could not break down the strong Dover defence. It was sod's law when on the break the visitors looked dangerous and missed a couple of decent chances but shortly afterwards they went ahead with a smart shot past Loach after a looping ball over the top had left the striker with a one-on-one with Loach and gave the keeper no chance and was free to slot home the chance on the half hour mark. Dover went two up in a couple of minutes as a shot across the box curled past Loach who, some might say, should have done better. It was all over, or should I say Dover, as they could have had five in the first half rout. Some around me went for an early pint after the second goal and some of them even went home, decrying the efforts of the home team. Molyneux had come on for Kitching just before half time as he was having a torrid time down the flank. Pools started to play football again and the question has to be asked as to why Moyneux did not start the game as his arrival lifted the Pools side and took some of the attention off James, who always had two markers on him whenever he got the ball. Once again the lad was battered and given no protection from the ref as he was bundled to the ground time after time. There was a clear penalty that was waived by the ref as a hand went up to palm a corner away; sadly, the only one in the Vic not to see it was the man in the middle and as the linos are not allowed to get involved in decisions unless asked by the ref, we were robbed again. I was amused by what followed: a Pools cross hit the hand of a defender and the decision was a penalty. Someone please tell me the difference? Or is it just a case of the ref being temporarily blind when it suits him? "I was praying that the ball was not given to Noble but fortunately Hawkes took the ball off him"
I was praying that the ball was not given to Noble but fortunately Hawkes took the ball off him; he had to wait a while as the visitors in turn took time to inspect the ball placing then try and dig out the penalty spot as Hawkes waited to smash the ball past their keeper, which he duly did. Three minutes later Pools were level as Luke James on a run was challenged and despite a little flip of a dive he was awarded a second penalty. OK there may have been a little exaggeration on the forward roll but it was definitely a penalty that Hawkes put away as cool as you like. Another great comeback from the team and so sad for the fickle fans who walked out when it was two down with the visitors still on top. As I said at the time, the NEVER SAY DIE fans were rewarded as the lads set about the shell shocked Dover team, who had started wasting time after going ahead on thirty minutes, kicking the ball away down the line and passing the ball around when getting a throw in, but I had a wry smile for the Dover sub who, while warming up in the first half was taunting the Pools fans and laughing up his sleeve as he showed a two nil sign to the angry lads in the Town End corner. He only came down once in the second half and ran straight back to the bench! The time wasting played its part as five minutes were added and Pools, on a roll, stretched the visitors who took off their danger man and put on another defender who then played up front but was offside every time they broke. It was just deserts for Molineux who, along with Amos and James, ran riot around the Dover defenders, some of whom should go to the local keep fit class. Molyneux got the winner with a lovely curling shot past the keeper after being put through on the left; the celebrations were mental, especially from the five hundred Pools youngsters in the Rink End after a scheme organized by the South East Poolies, who had set up a sponsor deal whereby any local team of youngsters could bring a group of kids to the game for a thirty pounds fee. Five hundred kids jeering and heckling the visiting keeper as he took the kicks and catches during the game was a sight to be seen, But the Pools goal celebrations were even better still with the Town End was bouncing as the goals went in. Sadly, some of the kids, nearly all in football strips, marched right round the ground at half time but as they set off the heavens opened and as many were toddlers, they were soaked and freezing by the end of the tramp but I bet they still enjoyed a great comeback win by Pools. Pools, as usual, continue to be a Jekyll-and-Hyde team, turning in good performances separated by stinkers! At least, barring a miracle or a points deduction (and don't forget that Birmingham got one last month), Pools appear to be safe with more games left than has been usual in recent seasons. It's not really been a good season for any of the North-East clubs. Newcastle seem to have survived without ever showing much ability to do more than that. Boro are making a late bid to stay in the Championship rather than finish in the playoffs. Sunderland still have a chance of automatic promotion but the playoffs seem to be their more likely fate, and they missed out in their Wembley cup final against potential playoff rivals. Pools are bumbling along in lower mid table and poor old cash-strapped Darlo are in a relegation fight while Spennymoor Town seem to be trying to take their place in the North-East pecking order. Just as the North-East is the poor end of the country financially, it's also destined to be the same football-wise. Or are the two in fact related and to be expected? What Is the Cure for Hiccups? Well, it was a hiccup last Saturday, wasn’t it? Four undefeated games against Braintree, Leyton Orient, Boreham Wood and Ebbsfleet led us to believe that, at last, we were getting things right. Sadly, we had the hiccup against Bromley and whilst most Poolies accepted being beaten by a better side, it was the standard of refereeing that left a bad taste in the mouth. I’ve always believed that FIFA make difficulties for referees but last Saturday was just downright incompetence of basic things. I’ve never known a home crowd chant ‘You don’t know what you’re doing’ so many times. Mind you, the assistant referee on the Neale Cooper side of the pitch wasn’t much better. There was one occasion where the ball was clearly about a foot over the goal line yet play was allowed to continue. If I could see the ball out of play with the onset of cataracts then just what the hell was he doing? The National League must really get to grips with refereeing standards – if they don’t then interest from fans will ebb away. There was an expectation on Saturday that our gate would be between 3,500 and 4,000 but it fell to 2985. Was this just Pools or are people getting fed up with this grotty league and lowering standards. Don’t forget, National League, that Rome burned while Nero fiddled. Anything’s worth a try to improve refereeing – how about retired players or, dare I say it, women whistlers? Is there any chance of the hiccups being cured? Unfortunately, the omens are not good. We have both injuries and suspensions. Carl Magnay is going to be out for some time and Michael Raynes won’t play again this season, having gone back to Crewe for rehabilitation. Then there is Luke James - how we could have done with him against Bromley. I guess he would have run them ragged. If that wasn’t enough, we now have Peter Kioso suspended for two games. And then we have up and coming fixtures – Sutton, AFC Fylde, Wrexham and Eastleigh are just some of the sides we tackle in March and they’re all above Pools. "I’ve never known a home crowd chant ‘You don’t know what you’re doing’ so many times." One weakness I’ve noticed with Pools is that we seldom threaten at set pieces. On Saturday, we were awarded a corner at the Corner Flag side of the ground and the ball sailed over the madding crowd for a throw-in to the opposition at the Cyril Knowles stand side. How about stationing someone to pick up the over-kicked corner – at least we'd keep possession and might be able to re-apply the pressure. Something for the training ground. Finally, when the next MB appears, we will have had Brexit (or will we?) Discussion has revolved around the possible effect on overseas players and whether they will need work permits. All this goes over my head as it's an internal matter for the bog-standard Premier League – and to a lesser extent, the Championship, whereas many clubs like Pools continue to be composed only of British and Irish players. They say you can't make a silk purse out of a sow's ear and the three managers who have graced Victoria Park this season can verify this. A bunch of serial under-achievers are coasting along in mid-table in a league we should be walking away with. All hopes of a quick return to the Football League have long since gone down the toilet. We now have Hignett back in the hot seat despite previously claiming he did not want the job. But why would Pools or any National League side need a director of football. Even Manchester United have not got one. "A bunch of serial under-achievers are coasting along in mid-table in a league we should be walking away with." Hignett hardly endeared himself to the long-suffering Pools fans when he took over by claiming what they knew about football you could get on the back of a postage stamp. And then proceeded to make Xavi a regular in his team, bigging him up in the process. This put a huge question mark over Hignett's football knowledge. The Mill House elite know a crap midfielder when they see one, having had to watch a succession of them over the years and believe me the little Fat Fella is a crap midfielder. This might have been an attempt at Scouse humour from Craig but he is no John Bishop. Hignett should try driving more slowly in his car and forget about postage stamps and put his effort into beating rubbish teams like Bromley at home. It is good to see Antony Sweeney being bought into the first team coaching picture as he is Pools through and through and a talented coach in the making. Talking of coaches it would be nice to know what goalkeeping coach Ross Turnbull does during the week. When Scott Loach joined the club 18 months ago he was arguably the best keeper in the National League. This season he is a liability. Won't come for crosses, 6ft 4in and can't jump so what has Turnbull done to him. With Dimi Konstantopoulos due to be released from the Borer at the end of the season it would make sense to sign him on and release Loach and Turnbull. Dimi certainly would not need any coaching from any of that lot at the Vic. 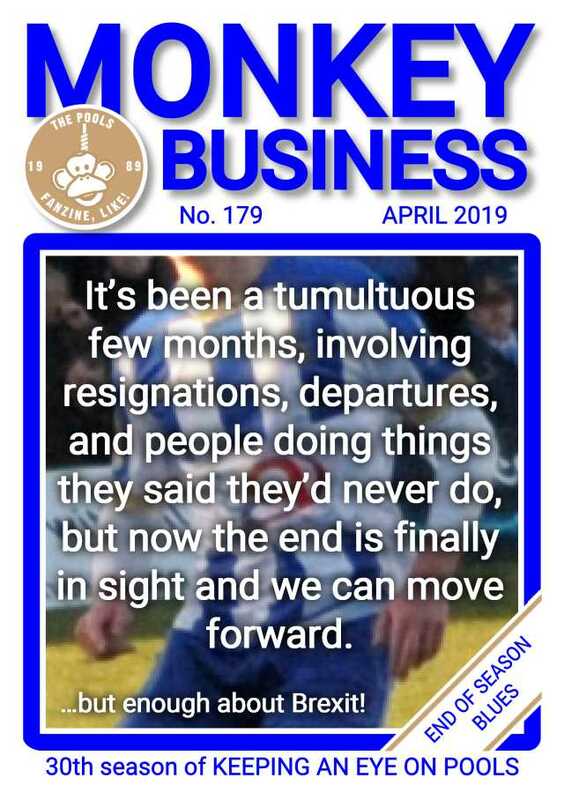 With time approaching to sort out the retained list for next season it is to be hoped it is a proper clear out and not just five or six players going and some staying because they will accept lower wages. There will be a flood of players up for grabs in the summer and I would say 50% of them will be better than we have at Pools. For the record the players I would keep are Peter Kioso, Liam Noble, Luke James, Josh Hawkes and I would also sign loan men Michael Raynes and Nicke Kabamba, and possibly a couple of promising youngsters like Luka Murphy and Josh Scott, before any other club can get them off us for a song. The price for the upcoming game against Wrexham has been reduced to £10 for adults, and not before time. Charging on-the-day punters £20 to watch the shite that is on show is daylight robbery. I have seen more effort put in by players on the Rec than by some of the bozos wearing a Pools shirt. Don't know about the rest of you but I am looking forward to the 2019/20 season already. I am sure that when Craig Hignett, Raj, the players, those that are still with us that is, cast their eyes over next season's fixture list they will be delighted. With luck we could see the departure of Orient and Wrexham (or Sutton) as they move up to League Two. Currently eight of the bottom nine clubs in the National League are from darn sarf or, in Dover's case, from France. Unless Chesterfield decide to press the self-destruct button we could see the likelihood of four Southern teams exit the National League in one job lot. I'll raise a glass to that. Obviously two of these relegated teams will be replaced by two other southern teams from the National League South. All is not lost, as we could see a few old favourites from League Two such as Notts County, Morecambe, Macclesfield or Port Vale renewing their acquaintances with Pools but this time in the surroundings of the National League. The only dark cloud being Yeovil, who seem to be getting homesick and hellbent on joining the Division Two relegation battle to make a return to non-league football where they rightly belong ...along with Stevenage and Crawley. The other added bonus is that two teams from the National League North will be joining Pools' fixture list. Chorley and, all being well, Spennymoor, who are currently only a couple of points off top spot of that league. Should everything fall into place, it will redress the present geographical balance somewhat, as at present 15 of the 24 teams in the National League are from the south. If my sums are correct, with all the above comings and goings that should see 4 additional teams from the north join the National League, all within a couple of hours' striking distance from the town. "Currently eight of the bottom nine clubs in the National League are from darn sarf or, in Dover's case, from France." Think of the benefits: less miles travelled over the season for both players and fans equals less costs for overnight stays and sundry expenses and more importantly no excuse for player or even fan fatigue. We could also see an increase in the number of away fans seen at the Vic. I know Spenny only brought 350 fans to Darlington this season but that is still ten times what the likes of Braintree and Havant brought to the Vic. If, as I hope, Spenny do get promoted, it is only an eighteen mile trip to the Brewery Field, whereas the trip to our old rivals Darlow is 28 miles away thus making the Moors our new derby team. The other major benefit to Pools and the fans alike is not having to watch these southern teams. To be fair I can't tell one from another: Braintree, Barnet, Bromley, Boreham Wood. To avoid confusion they should be forced to rename them: M25 United, M25 Town, M25 Athletic and M25 Wednesday. My main grievance with southern sides, and let's not beat about the bush here, London Clubs, is their savvy. They are students of the art of gamesmanship so much so that they would put Don Revie's Leeds sides to shame. Time wasting, moaning throwing the ball away. In the ref's ear all the time. Generally speaking, these teams have some very big lads playing for them but they still manage to fall to the ground at the slightest touch with an accompanying shout or a scream before they hit the deck to attract the referee's attention and then spend ten minutes getting treatment and rolling around in feigned agony. Then when they score, the scorer turns to the Pools fans with his hand to his ear. If you can't beat them, then join them so Pools should possibly take a leaf out of their book and give them a dose of their own medicine. Jake Cassidy got some flak recently when he said in the press that Hartlepool is a negative club and that the atmosphere at the Vic can be poisonous. You could argue that Cassidy had a bit of a grudge against the club when he made this statement. For one reason or another he himself was not exactly a fans' favourite so the feeling may be mutual, but when I think about it, he may to an extent have a valid point. It has to be said that it is clearly noticeable that at times some sections of the crowd/individuals are far less tolerant of the team than in recent years. Perhaps this is down to the club's slow decline over the past 7/8 years and the level (I won't say quality) of football which was being served up week in and week out. The one thing that stands out for me now is how early in the game some fans are on the players' backs or players are singled out for special attention. At a recent home game after the P.A. announcer had given out the starting elevens you could see the tangible disappointment on the face of one fan who stands down in the front of the Town End, that Niko Muir was not playing. He was devastated. His assigned boo-boy was not going to take to the pitch. In truth he has been on Muir's case for some time and as everyone predicted, including Monkey Business, because of his previous part-time status, at some stage Muir was going to struggle with full-time football and was inevitably going to run out of steam. For this particular individual Muir could do no right and he was delirious with delight if Muir had given a bad pass or lost the ball, just to reinforce his case. I would love to see this fan's reaction if Muir scored a worldie. Probably walk out of the ground in disgust. His afternoon did not end in disappointment as after 10/15 minutes or so he had found an alternative boo-boy in Liam Noble. Personally I think Liam Noble is one of the few decent footballers at the club and really should be playing at a higher level. On the day however, he was not having the best game of his life but was still giving it his all and wanting the ball. Though not his fault, his first couple of diagonal 30-yard passes into space went out of play mainly because the wing back in question hadn't bothered to run into that space. Noble then delivered a succession of poor corners and free kicks and it was not just young fellow-me-lad in the Town End who was starting to have a go at the midfielder but other sections of the crowd as well. Noble, not unlike like Ritchie Humphreys, always wants the ball even when things are not going his way; he will not hide when things are not going right and is still demanding it. As such, like Humphreys, he probably sees more possession of the ball over ninety minutes than any other player on the pitch which means by the law of averages he will make more errors which are all the more highlighted than for an example a teammate who hardly comes into contact with the ball or shies away from it when things are not going right. "I would love to see this fan's reaction if Muir scored a worldie. Probably walk out of the ground in disgust." At the end of this match the normally ebullient Noble left the field a tad crestfallen; you could almost hear him thinking "What on earth am I doing here? I don't need this abuse." If it is bad for the seasoned professional I think the treatment to which some of our younger players are subjected is totally unfair, and this is what Cassidy is getting at, an example being Kenton Richardson. In one game under Bates, and just coming back from injury, he came on as an early substitute for an injured player and was like a square peg in a round hole as he was being played out of position. Nothing went right for the lad on the day; he did not know when to go forward or when to stay back but every error was followed by a boo or a groan or much worse from the Mill House side of the ground. The lad is an excellent prospect for the future and has only just turned 19. With sub appearances included he has only played 30 or so games for the club and most of those last season in a very poor side. What many people forget is that the lad like many others at the club is still learning his trade. What must he and other youngsters in the squad feel like before they leave the dressing room, knowing that some sections of the crowd will be straight on their case early on, highlighting even the slightest error. Even before a ball is kicked they must really be on edge. Worse still is what they are feeling 90 minutes later in the dressing room having been subjected to the unnecessary vitriol from the terraces. Word gets around and many visiting players who have experienced the negative vibes directed at Pools players might be reluctant to sign for Pools if the club were to come knocking on their doors, owing to to the toxic atmosphere of the crowd within the ground that they would have to play before. I admit that it is only a small element sporadically spread around the ground that are part of the problem but my main concern is not only how it has a negative knock-on effect on the team's performances overall but more importantly how it impacts the younger players. One only has to look at Pools' home record - 10 wins in two seasons. I am sure that the fear factor instilled into the players through some fans has played its part in achieving this dismal record. Taken from from the Book 'A Tenner and a Box of Kippers' There are a lot of nasty people in Hartlepool. There are several hundred nice proper people but the majority of them are nasty people. There are more of them at Hartlepool than anywhere else. Also from the same book, about Chris Beech getting abuse from the crowd. Chants of: "What are you doing out this half Beechy?" The result: Chris Beech was suffering a nightmare afternoon as everything he tried fell to pieces.